To the last-named three histories in particular the compiler stands so deep in debt that it seems hideously ungracious to point out in Mr. Bruce’s account of the Stephens-Harrison duel, as given on page 245 of the Social History, a curious misprint, whereby the wrong participant is killed; but, thus embalmed in a work of such perdurable worth, the error is of grave weight to all descendants of Captain Richard Stephens, since it untimeously bereaves them of their progenitor an awkwardly long while before his marriage. Yet — be it repeated, — it is only the splendor and finality of Mr. Bruce’s achievement which lends importance to any mistake therein, such as elsewhere might be trivial. We find this ironic because Mr. Cabell’s work is the foundation of every Ballard genealogy, and as a consequence has the “splendor and finality” he wrote of one hundred years ago. In an effort to understand the descent of the Ballards who resided in Charles City County and their progeny, this compiler has been studying the record books, especially wills and deeds book covering the years 1725 to 1731. This book was unknown to Cabell; it was carried off during the War Between the States, remained in private hands, and returned to Virginia in the early 1970s. There are several records Cabell would no doubt have included in his book. For example, the will of a William Loyd of Westover Parish (dated 16 December 1724), who devised property to John Major and Sarah, the wife of John Major; this observation borders on speculation and would require additional study, but perhaps this Sarah was the sister of William Loyd. Another, and more importantly to readers of this blog, is the will of Elizabeth Ballard of Westover Parish (dated 22 May 1726). Elizabeth and her children have no place in Cabell’s narrative; conscientious researchers acknowledge it but don’t know what to do with it; others simply ignore it. For the reasons outlined below, this compiler believes that Elizabeth Ballard was probably the wife of William Ballard, the youngest son of Thomas Ballard of James City. An Act for enlarging Charles City County; and for consolidating those parts of the Parishes of Westover and Weynoake, on the North side James River, and that part of Wallingford Parish, on the Westside Chicohominy River. An Act to divide those parts of the Parishes of Westover and Weynoake, which lie on the South side James River, from those parts of the said Parishes which lie on the North side the said River; and for uniting Westover and Weynoake Parishes; on the South side James River, to Martin Brandon Parish, in the County of Prince George; and for erecting a Chapel in Bristol Parish, in the said County. See Louis des Cognets, Jr, English Duplicates of Lost Virginia Records (Baltimore: Genealogical Publishing Company, Inc., 1958) pp. 172-77. It appears that all of their property fell into Charles City County with the boundary adjustment with James City County in 1721. Curiously, there is an entry in James City for a Thomas Ballard owning 100 acres. We are inclined to think this Thomas is William’s son. Curiously, there is no enumeration for Ballards anywhere else in the colony. But while family traditions may evolve over time, at their heart is a kernel of truth. Mr. Moore includes in his account a letter from an Isaac H. Christian, who writes of how William Ballard of Ballardsville fought in the Revolution, and that his (unnamed) father owned the property after the death of Ballard. This statement is deceptive, implying that Mr. Christain’s father purchased it from William Ballard’s heirs. A quick Internet search reveals that one online genealogy reports that Isaac H. Christian was born 25 May 1831 at Ballardsville. His parents were James Hendricks Christian (1794-1873) and Susan Brown Hill (she died 1857). Apparently Susan Brown Hill inherited the place from her father, Isaac Hill (see below), then the property passed throught he Christian family. 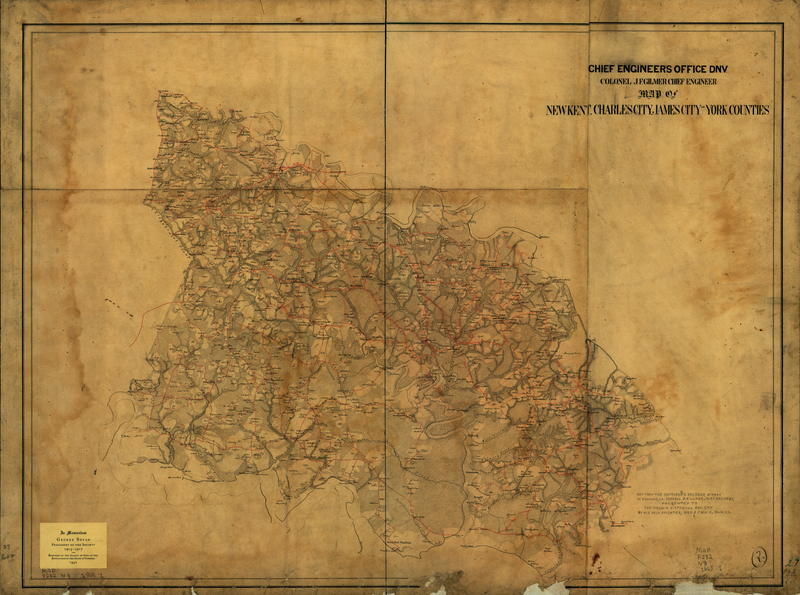 The Christian’s land holdings in the vicinity of Blanks Crossroads are evident in this map we found in the collection of the Library of Congress. Note that the land is due north of Kennon’s Landing and what is now called Kennon’s Creek (but identified here as Swanneck Creek), and would have been part of James City County in the early 1700s. In this detail of the map above, note also some of the neighboring family names associated with this branch of the Ballard family surrounding Blanks Crossroads, which we know was in the vicinity of Ballardsville: Clopton, Major, Marrable. Who did James Hendricks Christian purchase Ballardsville from? Most likely it was from the heirs of the Thomas Ballard of Charles City county who died without issue in 1804 (this is something we would like to verify). Thomas’ will speaks wistfully of the graves of his ancestors on his land: 13 August 1804. Will of Thomas Ballard of Charles City County, Parish of Westover. Just debts shall be paid. The family burying place now on my land shall remain solved and free for the internment of the family & their connections. That is to say a sufficiency ground for that purpose and for no further disposel. This I do for through the respect and duty I owe my ancestors and family and hope the same may be remembered by those who may ever consider it. An unverified online genealogy of the descendants of James Blanks notes that a Thomas Blanks (c.1766-1808) married Mary _____, and that “Thomas is listed in the Charles City County, Virginia census in 1787 as a taxpayer, which indicates he was probably born before 1766. His will indicates he was the owner of the Tavern, purchased from Thomas Ballard, marked on the County Map as Blanks Tavern (Charles City County WB-2, p. 14). Thomas [Blanks] is believed to have died in 1808, since his wife is the property tax payer in 1809.” One of the children of Thomas and Mary Blanks is Mary Ballard Blanks, suggesting a familial connection. This leads us to the conclusion that William Ballard, son of Thomas Ballard of James City county, married Elizabeth, whose sister Sarah married Henry Soane (incidentally, Henry’s estate was probated by what appears to be a second wife, Rebecca Hubbard Soane — the Hubbards being Ballard relations); they resided in that part of James City county that became part of Charles City county in 1721, and it is their descendants who are described in Cabell’s The Majors and their Marriages, which, while well researched, like so many other publications of this sort (including this one) contains errors. The vast majority of Ballard researchers accept the proposition that this William Ballard is the son of Thomas Ballard of James City county and resided in the Northern Neck with his wife Philadelphia, and produced that line of Ballards that included families of relatively modest means that emanated from Caroline county — some Quaker, some not. We discount this theory because (1) there is a stark lack of connection with the known family associations of the Ballard siblings, such as the Soane, Hubbard and Goodrich families. ; (2) the assumption that this family wedded to the Virginia establishment would convert to Quakerism makes little sense, absent compelling evidence to the contrary. On William’s death, whatever real property he owned would have been devised or passed to his eldest son, so it is likely that the Thomas Ballard who married Mary Dancy is his eldest son, and Thomas’ son Thomas (who left an estate valued at £723, a not inconsiderable sum). 1. Accounting for what happened to Thomas Ballard, son of Thomas of York County. To date we’ve relied on Cabell’s conclusion that he must have been bound out to John Major according to the terms of his father’s will (the will is silent on this), which is what he assumed brought Thomas to Charles City County. Hopefully the solution to that problem will be the subject of a future post. He could very well be the answer to another vexing question — the ancestry of a Thomas Ballard who lived in Stafford County in the early 1700s. 2. The full name of the Ballard killed at Charles City during the American Revolution on 8 January 1781. To date, we have been unable to find additional documentation that may shed light on this event and provide the name of the soldier killed; so far, only applications to patriotic societies by Talman descendants have turned up. 3. Cabell names two daughters of Thomas of Charles City, Elizabeth Ann (who he identified as marrying Henry Talman; subsequent genealogies call her “Ann Elizabeth” in an effort to reconcile the two), and Mary Ballard, who married John Major. We’d like to confirm what is known about them. Meanwhile, we have been re-ordering the genealogy contained herein to reflect this conclusion. 1. Recorded York Co. Va. Deeds, Orders Wills 1672-76. 2. Deed recorded 9 December 1686, Stafford Co. Deed Book D, Part 1, pp. 19-19a. Sarah, wife of Henry, relinquishes dower; Mrs Mary Mansell relinquishes right, and her signature is acknowledged by John Waugh, attorney for Henry Blagrave. This is most likely the same Henry Blagrave, II who was a devisee in the will of William’s nephew, Matthew Ballard. See notes on the Blagrave family appearing in Allied Families. Note also that among the Minutes of the Council and the General Court there appears an interesting order: “Mr Thomas Ballard, on the behalfe of Mr David Mansell moved this board that the word Thomas in a former order of this Court might be made John about land deserted by Jno. Suggett; it is ordered that Mansell’s . . . to Mr Ballard be recorded.” H.R. McIlwaine, Minutes of the Council and General Court of Colonial Virginia (Richmond: Virginia State Library, 1924) (Richmond: Virginia State Library, 1924) p. 225. This indicates that Thomas Ballard had acquired land from David Mansell. 3. James Branch Cabell, The Majors and Their Marriages (Richmond: W.C. Hill Printing Co., 1915) p. 101. “24 November 1691. Mr William Ballard, asignee of Benjamin Goodrich, attorney of Mrs Alice Ballard, exor. Of Coll. Thomas Ballard, dec’d., plaintiff vs. James Harrison, deft. Having brught an action of debt against James Harrison, the suit is dismissed with cost, the deft. having made oath that the debt was paid to Mr Jerom Ham by order of ye said Thomas Ballard.” York Co. Va. Deeds, Orders, Wills No. 9, Part 1, p. 35. 4. The list includes Benjamin Goodrich, Francis Dancy and Henry Soane, Jr,; the latter two are known to be Ballard relations. Public Record Office, File No. C.O.5/1312, in Lloyd DeWitt Bockstruck, Virginia’s Colonial Soldiers (Baltimore: Genealogical Publishing Co., 1988) p. 216. 5. The Quit Rent Roll of 1704-1705 was ordered by Governor Francis Nicholson; a copy was sent to the Board of Trade and is preserved in the Public Record Office in London. It was published as an Appendix to The Planters of Colonial Virginia (1922) by Thomas J. Wertenbaker, and reprinted in his compilation of three earlier works, The Shaping of Colonial Virginia (New York: Russell & Russell, 1958) p. 211. The same Roll lists Thomas Ballard as owning 100 acres in James City county. It should be noted that the Quit Rent Roll of 1704 does not include the names of property owners residing in the Northern Neck, for they paid their Quit Rents to the Proprietor of the Northern Neck, not the Crown. 6. It should be noted that William Aylett was the third husband of Sibella, the widow of Matthew Hubbard of York county, making William Aylett and William Ballard cousins by marriage (William’s brother Thomas Jr having married Katherine Hubbard, the daughter of John Hubbard in 1684. The Jerome Ham referenced in Note 3 was Sibella’s second husband). See Cabell, pp. 68-70. 7. Deed dated 24 April 1708, recorded 28 April 1708, Essex Co. Va. Deeds & Wills No. 13, p. 197. “One Price & Ball” is probably an incorrect interpretation of difficult handwriting, and needs investigating. An earlier deed dated 8 December 1703 between “Benjamin Goodrich of James City county, Gent., to William Aylett, Gent., of King William county, for £22, 200 acres in Essex Co., part of a tract taken up by Joseph Goodrich, William Batt, and Jno. Price, adjoins Mr John Lightfoot’s land, and Mr Edward Chilton’s land – this 200 acres, commonly called Mt Maple and sold to the said Joseph Goodrich on February 2, 1691 by John Clark, then of Rappahannock county, and is now vested in Benjamin Goodrich by act of law, as heir of the said Joseph Goodrich, sometime since deceased.” Recorded 10 December 1703, Essex Co. Va. Records, 1703-1706, p. 132. This last document requires some explanation. The founder of the Goodrich family, Colonel Thomas Goodrich, acquired land in Old Rappahannock county that later became part of Essex county when that county was created. In his will dated 15 March 1678/9, recorded 3 April 1679, he left large bequests of land to each of his children. To his eldest son Benjamin, he left “200 acres of land on the river side which I bought of Clement Thresh and one-half the difident of land I now live on with all the profits, commodities and emoluments thereto belonging” (this being about 3,000 acres). The other children received 400 to 1,000 acres of land, and the rest of his estate went to his wife, Anne. Sweeney’s Wills of Rappahannock County, pp. 76-77. Benjamin Goodrich resided in James City county, where he was listed as a Justice there on 6 April 1685. He also served the James City county Militia, and was Sheriff on 3 March 1692, for on that date in the Calendar of State Papers appears a communication by the House of Burgesses to his Excellency, the Governor, “that they had been informed by Captain Benjamin Goodrich, Sheriff of James City county that he had been commanded to provide an officer to attend the House.” The will of Benjamin Goodrich has been lost, but we know he had one because his wife, Alice, having married Edward Sorrell, appears in several documents as his Executrix, for on 27 April 1695 there was an acknowledgment in the General Court a deed for some land to John Griffin, which was also recorded in the Essex Co. Va. Wills & Deeds, 1702-04, Book 11, p. 2. We also know that at least one son survived him, for a Benjamin Goodrich, Jr appears in the Quit Rent Rolls of 1704 as possessing 1,650 acres in James City county, and whose death is noted in The Secret Diary of William Byrd as having occurred on 29 April 1710: “April 30, 1710 Colonel Duke told me that Ben Goodrich died at night and was well that morning 2 days since.” Benjamin Goodrich was the heir-at-law of his brother, Joseph Goodrich. Another deed dated 1703 from Benjamin Goodrich to William Aylett of King and Queen county was for land that was part of a tract bequeathed by Col. Thomas Goodrich to his son, Joseph, who by his will bequeathed it to his son, Danby Goodrich. Danby Goodrich died in his minority and the land reverted to Benjamin Goodrich as Joseph’s heir. Source: an online posting by Charles Hughes Hamlin, The Goodrich Family of Virginia. 8. Charles Roan’s patent is dated 7 August 1667, for 401 acres upon the North side of Kittawan Creek in Charles City County. Patent Book No. 6, 1666-1678 (pt.1 & 2 p.1-692) p. 109. 9. Charles City Co. Va. Wills & Deeds, 1725-31, p. 220. 10. Hening’s Laws of Virginia, November 1720 – 7th George I. pp. 94-95. 11. 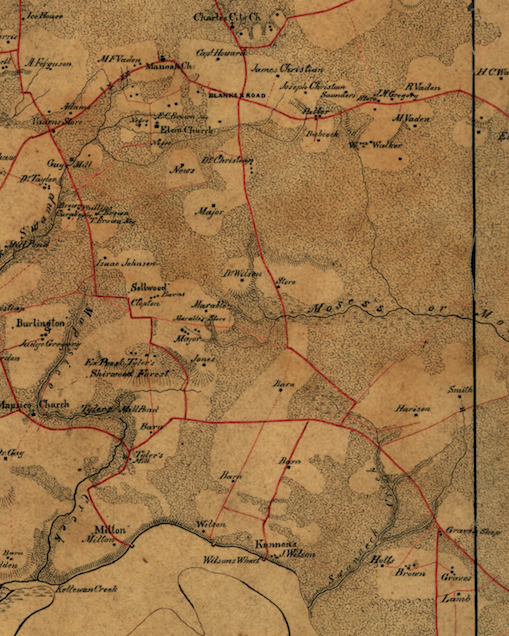 Charles City Co. Va. Will Book 1787-1808, p. 605. ← Talman of New Kent and the Ballards of Charles City County in Virginia.